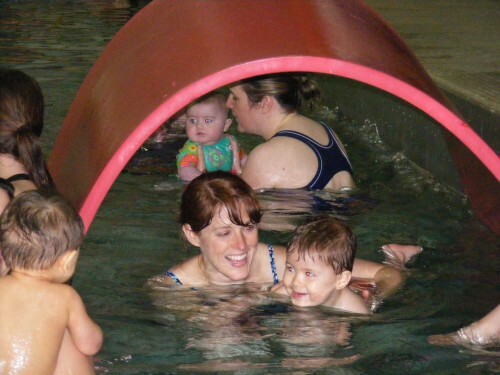 On Friday afternoons, Owen and I go to the pool for “Starfish” level swimming lessons. 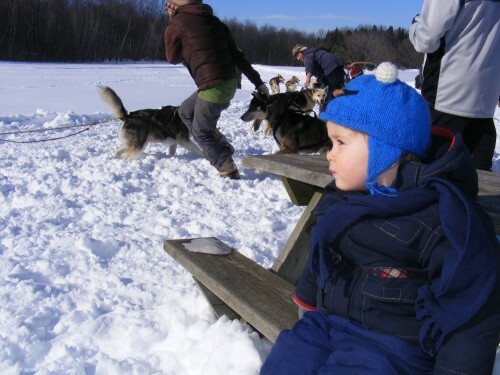 We did the same class last year, from January to March, when Owen was 7 to 10 months old. Then, as I do, I missed the next sign-up deadline, summer came, and then I thought, well, better to wait until the skills and familiarity he gains can be put to some use (i.e. in the summer). So here we are again. 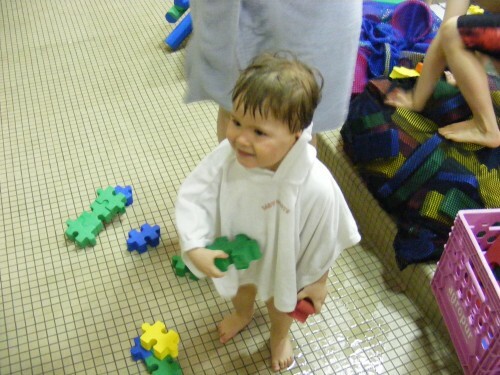 Owen LOVED swimming last year, but this year, in his almost twos, he is bad at beginnings in general. He cries when he arrives at birthday parties right now. The first lesson was a little bit stressful because it took a lot of encouragement and distraction to keep him involved in the activities. Last week was better: walking the plank (walking across a floating mat and jumping into my arms) and going under the tunnel were both a big hit. Owen’s newest word is “happy,” which is so fun. We discovered he could say it yesterday when he was looking at his Richard Scarry’s Best Word Book Ever, in which there is a page about emotions and actions and such, and there are three pigs in a row, one laughing, one smiling, and the third crying. Owen already likes to imitate crying. After he’s has a particularly bad crying episode (I don’t want to be at this birthday party or some other weird integration problem), we tease him about it afterward, asking what he looked like when he cried before, and he usually obliges with a rubbed eye and a boo hoo hoo (and then a grin). When he looked at the images of the three pigs, he said “happy, happy, boo hoo hoo (eye rub)” … and I think I reacted so delightedly that he’s been saying happy ever since. “Hapy, Happy! Owie Happy! Owie Happy! Mama Happy!” – And it’s true. A happy Owen makes a very happy Mama. 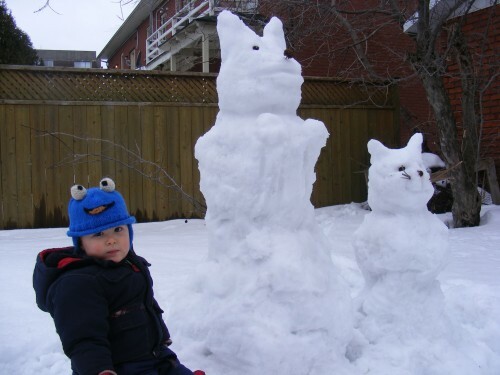 Owen and I built two snow creatures on the weekend. 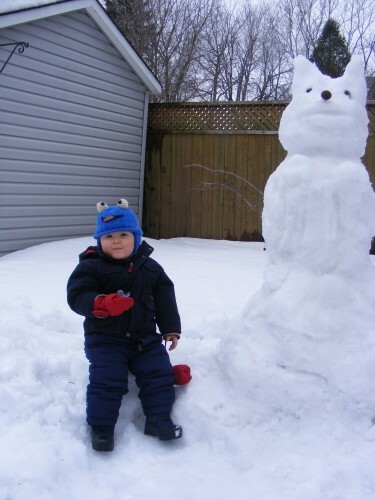 The snow was perfect for snowmen, but when I asked Owen what we were building, he said, “ouf, ouf” – so I made a dog. 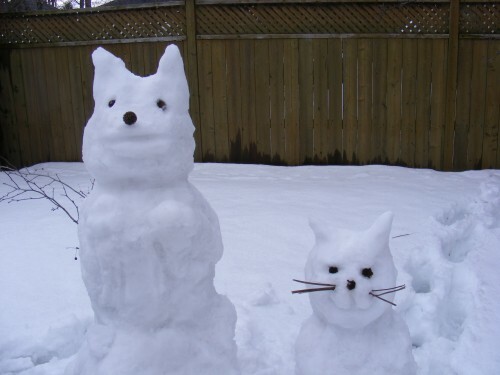 Then when I was finished, I was ready to go inside, but he said, “mo’ mo’ chat,” so I made a cat next to the dog. 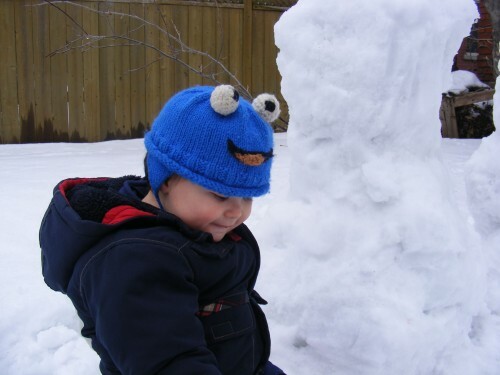 Owen helped me pat the snow down and roll the balls of snow. When we were finished, he said “Two!” (his favourite number, and the only one he really understands). Now he asks about “ouf, chat” several times a day. He said good night to them before bed tonight. 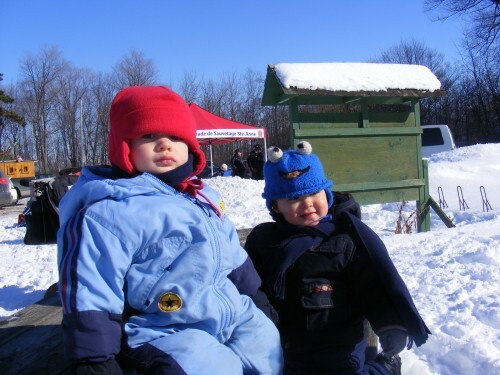 Author AnnaPosted on March 15, 2011 Categories Parenting/PregnancyLeave a comment on Ouf Chat Two! The title of this post is borrowed from a student, who wrote one of the most poetic lines in her essay I think I’ve ever read: “A child is a beautiful disaster created by love.” Isn’t that just lovely? And true? Owen is getting to an age where he likes to climb. He’s still a fairly cautious kid, so he’ll stand on the coffee table and look over for the disapproval he knows is coming, and get right down again. He’s mostly able to shimmy up onto the couch, though sometimes he needs an arm or a pant leg to grab onto. He sits on the edges of things, keels over, falls. He leaves miniature disasters in his wake: a trail of cheerios, a smattering of blueberries, a smear of banana, a drool of milk – but it’s all part and parcel of the growth and health (thank goodness) of the boy he is becoming. One of his favourite places to stand is a step stool that he likes to pull up to the kitchen counter. The problem with this stool is that every now and then he loses his balance and teeters backwards, and sometimes there is no one there to catch him. But seconds after I’ve kissed it better (kisses sound like this: “moooooah”), he’s ready to climb up there again, to be a participant in whatever is going on at the counter – usually some kind of cooking or eating, but sometimes just an adult conversation. Anyway, here’s to our beautiful disaster. Am I ever glad we made him. These are from a couple of weeks ago – the most glorious day of the winter so far, spent with a great friend, Rebecca, and her son Theo. 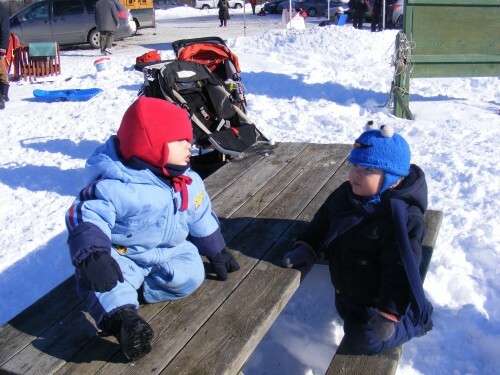 Rebecca and I met in prenatal yoga class and have shared many moments of early-motherhood angst – so it was nice to have our sons so… well… civilized for a change. 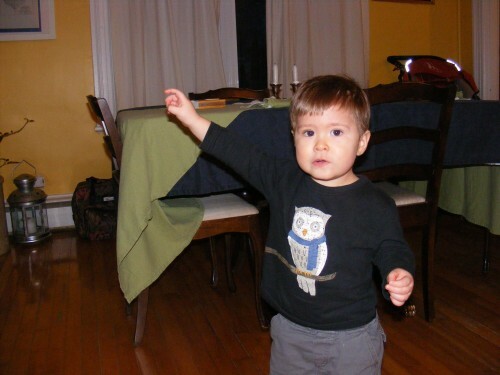 When Owen was quite small, he had some pajamas that featured a monkey riding a dinosaur. These pajamas initially struck us as cute, but later on we wondered what the designers had been thinking. Were they making a political statement? Were they suggesting that monkeys and dinosaurs roamed the earth together? We referred to them as his creationist pajamas, and were kind of sad when he grew out of them. We dragged Owen and his taffy over to an appropriate block and threw him in a snowbank so we could get to work. 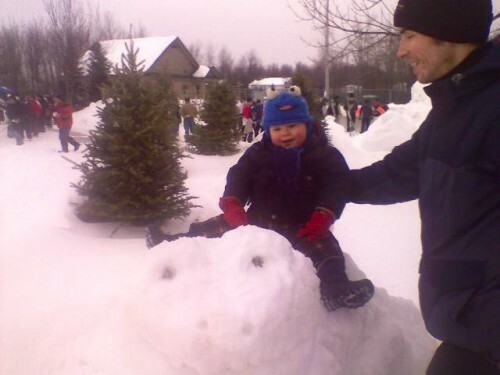 A colleague of mine claims that almost every story I tell of Owen lately involves me first throwing in the snowbank. 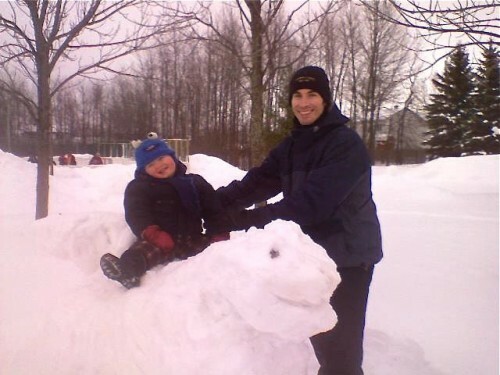 To be fair, Owen loves being thrown in snowbanks (literally) but I do not actually THROW him in snowbanks on a daily basis. 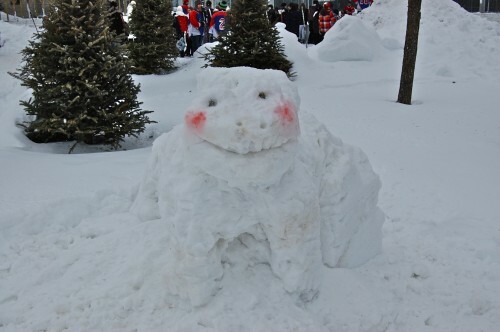 In this case, we (literally) sat him down in the snow so we could work our artistic magic and he could finish his candy. One of the corners already kind of looked like a dinosaur’s head, so we started to whittle away at the ice. As soon as we started, we realized how much more difficult it was going to be than we imagined. I still have bruises on my hands from smashing my trowel into the snow, only to find that it hid ice. We had also left the house wearing jeans and impractical clothing in general, so we got colder and wetter as the afternoon wore on. When Owen finished his taffy, we gave him one of the garden tools and asked him to poke holes in it (as a way to occupy him) because by this point, frankly, the carnival was about us, not about him. He played for a bit, and then some 80s tunes came over the sound system and he started dancing. He was having a good time. Duncan and I took breaks occasionally to dance with him. 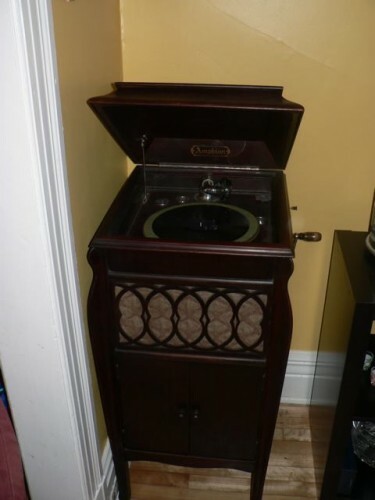 We don’t own a television. When we watch shows, we do so online on our laptops, because we can choose what to watch and when. We also listened to a CBC documentary called “The Hurried Infant” before Owen was born that detailed the pernicious effects of television watching in babies (a pronounced decrease in vocabulary for every hour of television watched), and what a mockery it is to sell “educational” DVDs to the under-two crowd. And yet, every now and then, and then more and more often, we have been letting Owen watch YouTube videos – mostly Sesame Street – and more and more he has seemed to like them and know them until recently (this week?) he started asking to watch videos, every day, twice or three times a day. Last night as he sat watching Katy Perry chase Elmo, I tried to engage him in conversation (about the video) – with no acknowledgement. I then waved my hand in front of his face. Twenty times? No reaction. When I said no more TV, oh la la… Owen began the biggest meltdown I have ever seen – tears, rage, running away from me, throwing blocks on the floor, incoherent blubbering… Now, he was tired, but really? Is this the effect of television on a toddler? Because I was really beginning to like the free time his videos gave me. On the other hand, he’s adorably into Grover’s “Near and Far” demonstration, and does his own “Nee” “Daa” game in his high chair, throwing himself back and forth toward me and away from me. He asks for “Nee Daa” while pointing at the computer and requests “Mo” and “Mo” of the clips he enjoys. So… it’s, like, educational, right? I have noticed recently how much I love my boy – like heart-swelling love. 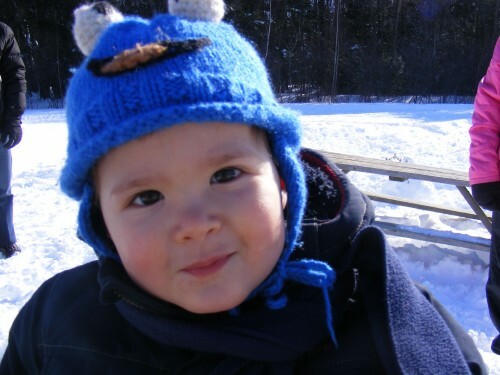 As he develops into his own little person, as he fills out his personality, I find myself filled up with pride – and my love has a different quality than it used to, which is why I feel compelled to write about it. I think it has to do with how much I like Owen as well as love him. He’s helpful, he’s kind, he’s friendly, he’s everything I would choose in a friend (OK – not the whiny bits, but they are pretty rare). We’ve started cooking together when I bring him home from daycare. He stands on his “stoo[l]” and helps me dump flour or milk into a bowl – or he eats the vegetables I am chopping (he didn’t like the onion). And he loves being involved, and it’s so fun to remind him that he made the pizza he’s eating, or the bread, or the soup. He’s a bit of a neat freak – not entirely sure where he got this quality from, since neither Duncan nor I is particularly tidy, but when anything is out of place (i.e. there’s jam on his finger or he finds a piece of lego under the table) we hear “uh oh… uh oh… uh oh” until the problem is resolved. I had to teach him that he could lick the jam off his own finger. But this slight OCD quality makes him very good at cleaning up his own toys (I think they foster this behaviour at his daycare). He’s also a great help when I need him to bring rinsed containers to the recycling bin. He’s also become so independent lately, so that I can send him off to his room to read a book while I shower, and sometimes he will spend 5 minutes (or more) by himself (and not destroying anything, but playing, reading) before coming to play peek-a-boo with his mum. I know I’m his mother, and I know I am supposed to love him, but I honestly wasn’t prepared for liking him so much.